Look for the global metalforming market for automotive to experience a compound annual growth rate of nearly 3 percent, from 2018 to 2025, when it's expected to reach $269 billion, according to a Research and Markets study. The Aerospace Joint Apprenticeship Committee (AJAC) partnered with South Seattle College and Buyken Metal Products, Kent, WA, to celebrate Manufacturing Day (October 5) at Buyken with students from AJAC's pre-apprenticeship program, Manufacturing Academy. The students received presentations from Buyken and AJAC on various topics including registered apprenticeships, the history of Buyken, what makes a quality employee and why manufacturing is a rewarding career. During the tour, students were able to fabricate metal airplanes on the shop floor, from design and concept, to the forming, bending, and engraving of each part. Porsche AG and Schuler, Inc. are teaming to build a press shop dedicated to the car factory of the future. Technologies will enable the flexible production of complex car-body parts, with the focus on aluminum body panels and small-batch production. 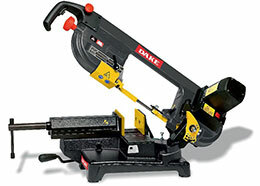 See Dake's New Benchtop Horizontal Bandsaw at FABTECH in Atlanta! Our new benchtop bandsaw line is small in size but not in power. Featuring reverse cutting technology faster, cleaner, and more accurate cutting. Designed for on-the-go applications for cutting right in the field. Stop by booth 8811 to see product demonstrations every day of the show. Learn more at www.dakecorp.com. 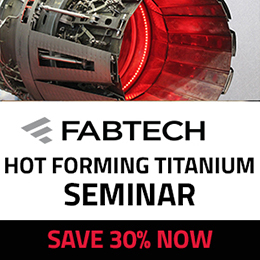 Kick off 2019 with a must-attend, info-packed event, the Metal Stamping and Tool & Die Conference, January 29-30 at the Nashville (TN) Airport Marriott. Presented by the Precision Metalforming Association in association with MetalForming magazine, the conference features keynote presentations, educational breakout sessions for stamping and tool and die, exhibits, and a networking reception for more than 200 attendees and sponsors. 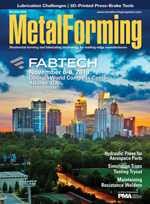 Track sessions feature new, emerging, evolving and maturing technologies, and industry trends that are impactful to metal-stamping, die-design and die-construction companies. Get details and register. 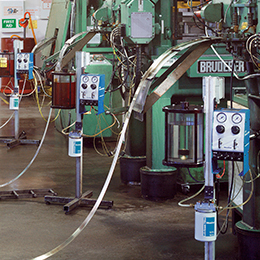 A new triple-action press enables Weldmac to form difficult high-temperature materials and increase capacity as orders soar. See also: Nordson EFD, LLC, Beckwood Press Company, Hilma Div. of Carr Lane Roemheld, Dake Corp.